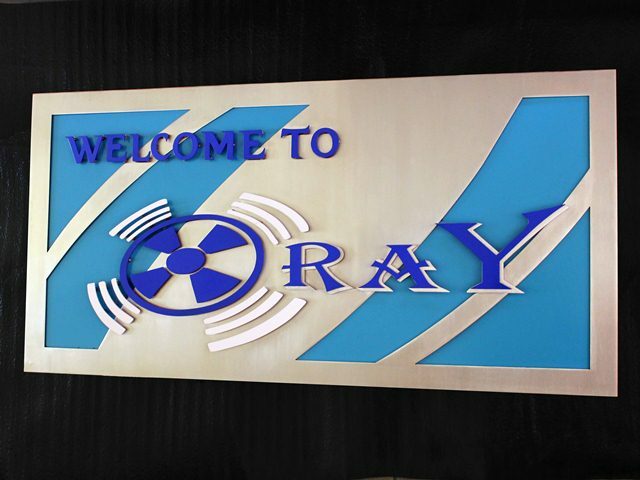 Savy Design's stainless steel company signs are designed for business entrance, reception area or lift lobby. We can fabricate your Company Name and Company Logo out of stainless steel or powder-coated metal in a variety of ways. They can be laser-cut from a stainless steel plate or powder-coated metal in our Cut-Out Plate version. These cut-out plate versions are then backed with acrylic backing panels, matching to your capmanies' colour scheme. Laser-cut lettering is also highly popular with our Company Signs. These can also be powder-coated to match the corporate colour scheme. This type of signage is mounted directly onto the wall or reception desk,making use of our Mounting Studs. We can also incorporate all of these techniques to create a company sign unlike any other. 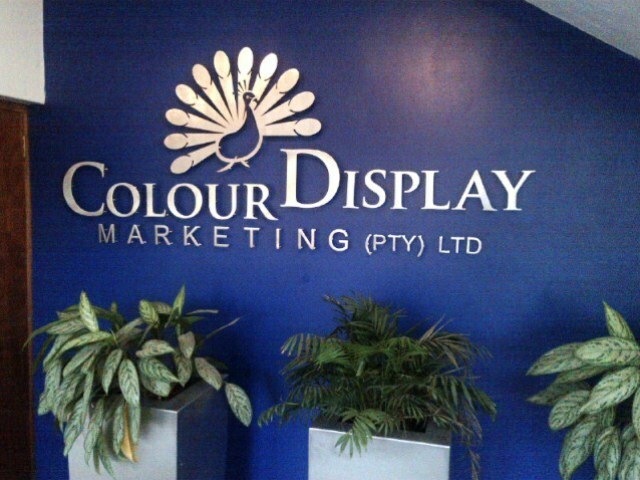 A Cut-Out Text Company Sign with a Peacock graphic logo for Colour Display Marketing. 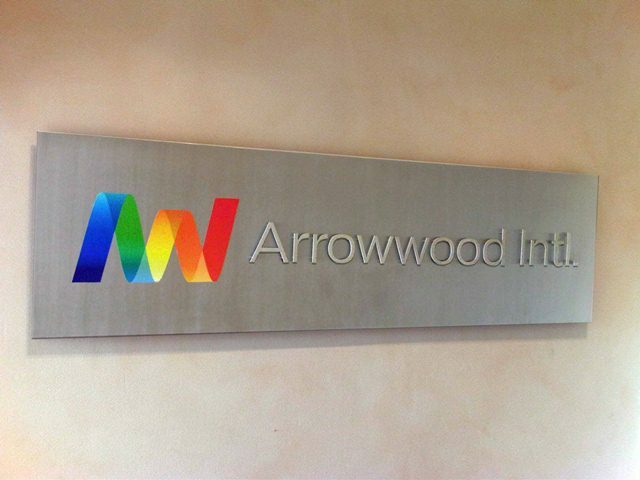 A Cut-Out Plate Company Sign with Super-imposed text produced for Arrowwood Intl. 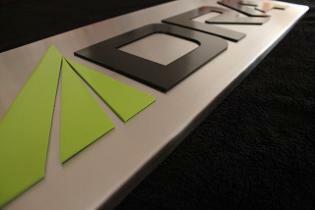 Company Sign for DRA - an international mining company. 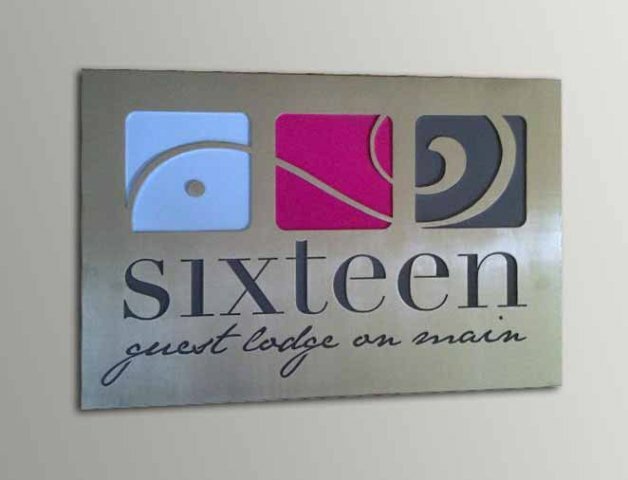 This sign was fabricated by creating a strong backing plate from two millimeter stainless steel, on which super-imposed - Grade 3CR12 stainless steel - lettering is attached with Mounting Studs. The logo, and other super-imposed text - was created from Grade 3CR12 stainless steel which was powder-coated to matched exactly to the companies' colour scheme. Stainless Steel Sign fabricated for Corporate Office Reception. Cut-Out Text mounted with Mounting Studs. 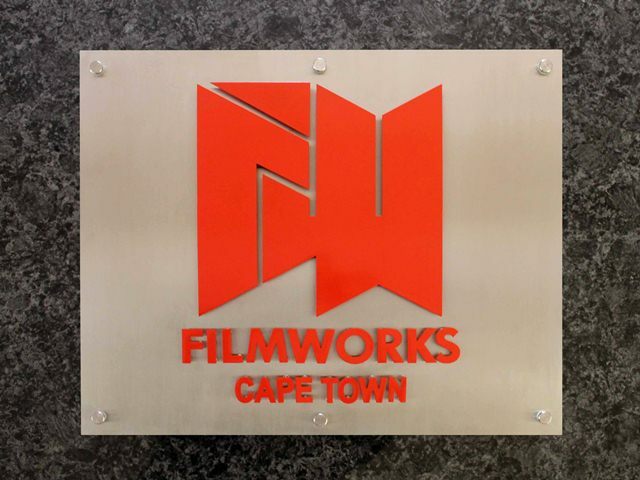 Stainless Steel Sign fabricated for Filmworks Cape Town. Super-imposed lettering on a Stainless Steel plate with Mounting Spacers. Stainless Steel Sign fabricated with a stainless steel plate ontop of an acrylic backing, super-imposed with laser-cut powder-coated lettering. 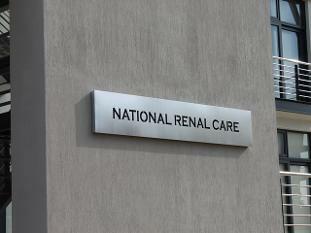 Stainless Steel Sign fabricated for National Renal Care. A stainless steel plate mounted onto a stainless steel box and bolted to the wall outside thier building. 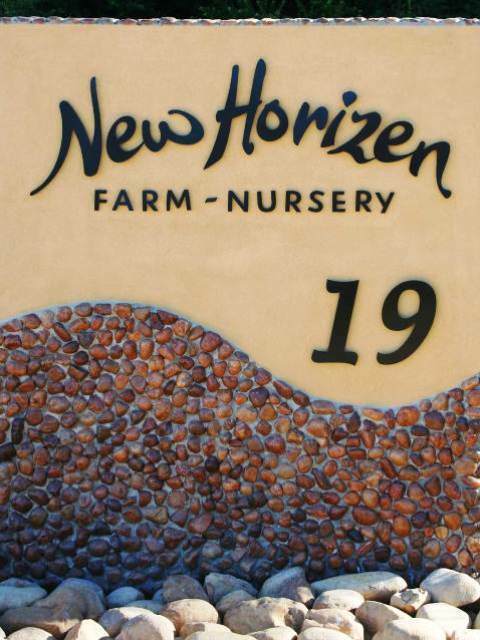 Stainless Steel Sign fabricated for New Horizen Farm Nursery. Grade 3CR12 Stainless Steel Powder-Coated Black and mounted onto the wall with Mounting Studs. 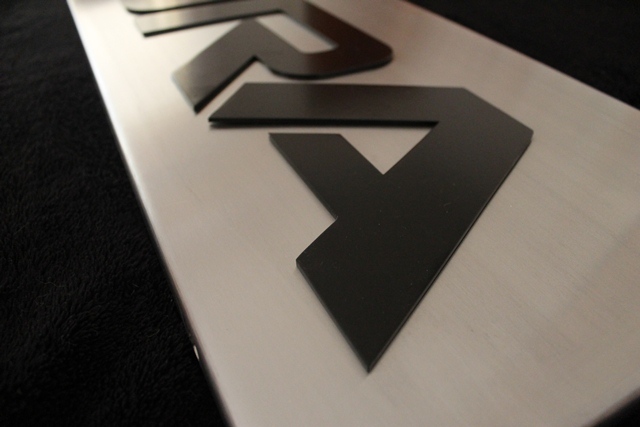 Stainless Steel Sign fabricated from a Cut-Out Plate with acrylic backing. 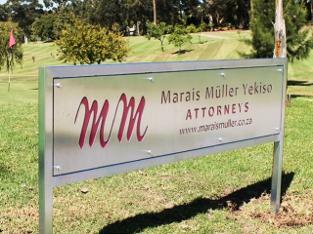 Stainless Steel Sign fabricated for Marais Muller Yekiso Attorneys. A stainless steel plate with cut-out text and a prespex backing panel. 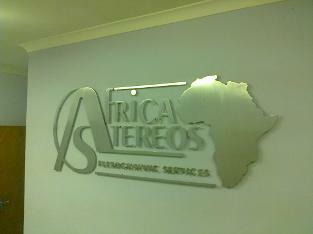 Stainless Steel Sign fabricated for African Stereos. Stainless Steel Cut-Out Text Signage mounted with Mounting Studs.